Spencer: Global Urban Heat Island Effect Study – An Update | Watts Up With That? This is an update to my previous posts [here and here on WUWT] describing a new technique for estimating the average amount of urban heat island (UHI) warming accompanying an increase in population density. The analysis is based upon 4x per day temperature observations in the NOAA International Surface Hourly (ISH) dataset, and on 1 km population density data for the year 2000. March 10, 2010 in UHI. Am I reading this right? Did I misinterpret your original analysis? Doesn’t the above statement run counter to the original work? I thought we saw greater warming in rural areas with an increase in population density? I like the log scale on the x axis. This is EXTREMELY useful, thankyou Spencer and Watts. Poor warmists..
James…my original results were based upon the year 2000 only, and (as I recall) global data…not US-only. Also, I have changed to log-plots, since (as you mentioned) warming in the global average IS much stronger at low population densities. How does the UHI correction vary with latitude? Golly, they are quite consistent ! – I have to ask though; Could the results somehow be wierd artifacts of the altitude corrections? I appreciate that this is a miserable response to an awesome piece of work! I think the US / Non-US labels are swapped in the 2nd graph? (That will get ignored by the mainstream ABCNNBCBS “news” centers. I would advise avoiding announcing which once you do decide. You could run into trouble with the gatekeepers. This is really important – we all know that there is a logarithmic decay in the IR trapping capacity of CO2 as concentration increases. That is true as long as the rate of IR remains constant; one can add more CO2 without much additional heat retention for the simple reason that there just isn’t any additional IR in the correct wavelengths for additional CO2 to absorb. BUT, if we are adding more heat AND more CO2, ther is scope for additional heat trapping. In this scenario, it is land use which is the most important factor and the one whihc is most easily changed. Simply changing from asphalt (low albedo) to concrete (high albedo) would result in a HUGE reduction in the amount of insolent radiation converted from short to long wavelengths. So-called green rooves would also make a difference in urban settings. These are things which are easily implemented and don’t disrupt civilization. I would hazard a guess that applying this a UHI correction based on the above would reduce the GMST trend significantly. It would be interesting to see each observation time broken out. I suspect night-time will show as the largest deviation, and its signal may be being watered down by the others. Would be very nice to see the pattern by geographic region or in latitudinal bands – it might help to explain what is going on. UHI remain something of a mystery to me. The general notion is obvious, and virtually self-evident (despite the “possibly negative” results that John shows! ), but the manner in which fairly well established numbers for urban warming are used seems to my poor brain to be lacking in clarity. We see long postings or papers that describe in detail some numerical values that describe the effect, but I seem to have missed some vital information that would set in stone the way in which these numbers are to be used. Let’s say that it has been established to everyone’s satisfaction that the urban heating effect for a particular place (called Town) is 1.4 degrees C. To me this means that if a series of actual temperature measurements is made at Town, and then reported in the literature as 10.0, 11.0, 9.4 and 7.1C, I, the user, should put them into my computer as 8.6, 9.6, 8.0 and 5.7C . Is this wrong? If so, what should I believe about the real temperature at Town. Should I accept that Town has recorded 10.0, etc and that this is the value to be included in my archives and analyses, or that Town has already done its subtraction sums (and thus their thermometer actually read 11.4, 12.4 etc). These may be stupid questions, but I would really like to have a clear answer. Can someone help me please? And now – what do we know about the AHI? The Airfield Heat Island effect. Ron over at the whiteboard was doing some data with gridded population density datasets. Somehow Jeddah,Riyadh,Dharan,Basrah,Najaf,Sulimaniyah,Kirkuk, Mosul and Damascus all ended up in his rural dataset. Those were just the cities I was familiar with. I would urge caution using some of the international datasets. A liberal dose of random checking via google earth can save a lot of embarrassment. Night lights tells part of the story, but that can lead to false rurals in areas that are electricity deprived. I believe the key to why the UHI doesn’t show on all years is where the UHI is showing up: In the nighttime temps and in the warm season (by a factor of 2-1 from what I have seen so far). So that would mean digging down to specific site conditions( cloudiness, RH) to find a common denominator. – its the log scale that’s throwing you off, I think. There is still a much higher temp gain per population gain at the low end. Dr. Roy could you tell me what is the phase relationship of the red pyramids in this video http://www.youtube.com/watch?v=II9jLTzPv30 to the Synod conjunctions with the outer planets? I would surmise that they lead the timing of the peak warming by about 3 to 5 days, about the same time as the Ice peaks before dropping off through the peak heating and most of the cooling phase. My question is what is the relationship, if there is one at all, between the outer planet Synod conjunctions, and the phase of this composite signal you have found. I know you haven’t looked yet, but let me know when you do. Way to go Spence! Finally there is the ~0.2C convergence near the global mid sea temperature that increases over last few decades. Here’s my take: back out the cities UHI influence and there is the solar grand maximum’s influence that also occured on the other planets. Good work! As population density increases you move to the right in Dr. Spencer’s graph and it gets warmer. That’s how i would read it. For the fact that the U.S. behaves differently than the rest of the world, i suspect it might be because the U.S. already had a high per capita energy consumption in 2000 which might not have risen as much during the last 10 years as per capita consumption in less developed countries. It should be reflected in the high GDP growth rates of, say, the BRIC countries. Just a guess. This obviously confirms UHI and puts some scale to it. But could you please explain why the graph starts at 0.2 as I would have thought that as the temperatures are relative to population they would have started at zero. this uhi effect i may have missed the point, does this apply equally to satellite data, this is something that one feels should have been analysed years ago, ie are temperatures higher because of population and can they distinguish on the grids like they can with these weather stations, do they measure 1 km square portions of the atmosphere as well. ppresumabley data beneath a certain atmospheric level would be more useful. i presume these statistics are probbly somewhere as i remember the satellite data average various areas of land threoughout the globe……………. This is is interesting, what we need to go with this is a map of global population density to get a feel for how much we are warming the landscape from our activities. I find the lower US figure puzzling, I wonder if this is related to pollution? So even a population of only 100 per Sq km shows an average warming of 0.8C over a nearby location with little development. But what about the recovery from the Little ice age, or more active sun, surely if we take this into account we may have had a slight cooling effect over the last 150 years? Afterall we now have Phil Jones of cru fame telling us that there has been no statistical warming over the last 15 years and the MWP may have been as warm as today, I mean where does it end? raw data or fudged data? You may have found one more way to prove data corruption. A nice population site http://sedac.ciesin.columbia.edu/gpw/index.jsp , boy do India and China have issues! This might not be as counterintuitive as it seems… albedo analysis dictates that you should see cooling if/when forest is cleared. So if development in the US, say more than other areas, begins by cutting down trees then it could explain this effect. I’d be curious if there is a difference in this effect, say, between Oregon and Arizona or New Mexico. This is a really insightful analysis, and I can’t wait to see it published. That said, I’d very much like to see this analysis done with latitude, altitude, and proximity to (significant) water included as potentially explanatory variables. It seems to me that low-density areas that are close to high-density areas tend to be located in “getaway” areas – mountains, oceans, or just areas preferentially to the north of the big city. It could also be that population density tends to drop as you go toward the poles, creating a bias for “low density” to be associated with “cooler” via latitude. I doubt that accounts for the basic findings, but it seems prudent to take the extra step prior to publication (it might also resolve the oddball US data). And if data like “distance from water” is not readily available, it might be a good opportunity for crowdsourcing the work – to, perhaps, readers of this blog. Still confused regarding rest of world vs US response with regard to population density and UHI effect. Does the US have better sited thermometers, thus minimizing the UHI impact versuse rest of world (maybe)? Does the US have more open space between urban/suburban areas that minimize UHI effect (more likely)? Also, does re-forestation of many rural areas in the US (plus having wealth to afford more green areas than rest of world) also causing the discrepancy (even more likely)? Thus, maybe we should look at more than two lines (i.e., US vs rest of world), such as 5 lines of stations at different population densities at DIFFERENT GDP levels. I don’t think it is necessarily as simple as that. One factor that has a big influence on the amount of urban warming is the wind – when there is a howling gale blowing, the temperature difference between a city and the surrounding countryside will be very small. The biggest difference in temperature will occur in still conditions, especially on frosty cloud-free winter nights. As we know only too well in the UK, the amount of wind can vary a lot between years. Some of the very mild winters that the UK received in the early 2000’s were largely a result of strong westerlies dominating the winter weather patterns, but more recent and cooler winters have had a lot less wind. As a result, UHI effects would be quite different between those years. “James…my original results were based upon the year 2000 only, and (as I recall) global data…not US-only. Dr. Spencer……thanks for clearing that up for me, for some reason, I was under the impression the first analysis was U.S. only. I went back and read it again, yep, I was wrong. So, naturally, it comes to a question, (and perhaps tangential), did you notice any trends regarding the development of the nation or area, such as 3rd or 2nd world nations? (Those terms are probably too ambiguous and subjective.) I would think other similar developed nations such as the U.S. would trend in a similar manner as the U.S. The UHI data shown (y axis) is not a time series (one year compared against another year). Instead, it’s the delta between two stations within 150 km of each other of differing population densities. Thus, gdp growth rates between 2000 and 2009 are irrelevent. However, average gdp for 2000-2009 for each station pair is relevent (and should be compared against one another and reported, as noted by me in an earlier post). My understanding of UHI was is that higher overnight or minimum temperatures are a hallmark of the UHI. Lower minimum temeratures than flow through to higher mean temperatures in the commonly cited data sets. It would be interesting to see the night time (or minimum) temeratures compared with daytime (or maximum temperatures for these 4hrly temperature datasets. In deveoping a “general theory” of UHI one would have to contemplate heat generation by urban communities of differing density, which might have complex or unexpected relationship to population density, and different seasonal characteristics. Economic factors might also drive UHI. Sorry to go OT, but I’ve been pondering a point you raised in your post analyzing station dropout (your raw ISH analysis vs. CRU), and I think I might have gotten the importance of the 36% difference in variability… would that impact the statistical significance of the temperature trend? 1. A shantytown covering all the land and leaving no vegetation in Logos, Nigeria. 2. A High rise, housing the same number of peoplebut surrounded by vegatation, in Munich or New York. I know its intuitive, but I would expect to see a difference. The preceding post wasn’t there when I submitted. So I’ll add that it seem Nick B. and I are having the same thought. Following your thought: it seems this might point to the U.S. actually cutting their influence during the 2000 decade (most U.S. citizens have had a huge guilt trip laid on them so they are cutting big-time) while the rest of the world goes along it’s merry way with city construction, big-time. For instance, I run my AC one-third what I use to in the 70-90’s, I heat my house to 60F instead of 74F like I used to, get the drift? Most American homes have cut way back, also added insulation, planted trees, putting a lighter colored roof on, etc. Seems this would have a negative influence when comparing U.S. to global UHI spreads. Dr. Spencer uses 1-year-warming averages against population density increase. That’s where the effect of growth over time creeps in or the dynamism of an economy/population. My PhD is in math, not statistics or the physical sciences, but one look at your first spaghetti graph convinces me that the argument you’re making is compelling. While the hypothesis and basic empirical facts are old hat, the analysis itself appears to be quite new. It’s a wonder it hasn’t been already done in this level detail, but I guess the billions spent on studying and massaging climate data didn’t have a few dollars left over for this, which evidently can be done with minimal resources. Well done Roy. In my view this should be submitted for publication with all due haste. On behalf of those interested in the US-only dip in low populations I would request that at some time you make clear which years display this anomaly, and predominantly at which locations. Immediately I wonder, is it always the same locations? Was it a cluster of years, or random? Perhaps Anthony knows of some move to refit rural instruments in certain years that may have had some effect. Also, someone should check that the U.S. data is truly raw source, untouched, homogenized, diced or sliced, which by itself could explain anomalous behavior like this. I’ve no doubt this sort of answer will pop out in the mix, given enough detailed information. I’m sure Zeke Hausfather on Lucia’s blog will pull another magic graph from his high hat…. what is the proportion of global UHI (joules) to the total amount of energy stored on Earth. If it is statiscially significant, this supports the view that man is warming the planet. BTW, re the guilt-trap: At least you can walk away when your house is under water. In Germany, the bank will auction off your house and use the money to reduce your debt. You still owe them whatever remains – so when you’re not paying your mortgage you lose the house and remain indebted to your bank. So don’t complain, you don’t know how good you have it over in the USA. Buying a house in Germany is plain madness when you have to take out a mortgage in my opinion and i don’t understand people who do it. You might have covered this, but a population density of 10 per sq km means scattered people avergage 300 m apart in a 1 sq km cell and there is plenty of room for a station with no UHI effect. However, an adjacent 1 sq km cell might have a people density of 1000 per sq km and so if the wind blows the right way, it might affect the zero UHI cell. It is valid to recalculate, by selecting a weather station and calculating the people density for the larger cell of (say) 100 sq km surrounding it, rather than a cell of 1 sq km? Then compare pairs of cells of area 100 sq km, keeping the rest of the methodolgy as is? Yes, it produces other complications such as land:water ratios etc, but I worry that a 1 sq km cell is too small a unit. It is the main way that I can envisage for the graphed strong rise in delta UHI with low population density pairs. So-called green rooves would also make a difference in urban settings. These are things which are easily implemented and don’t disrupt civilization. For some reason the term “boiling the ocean” comes to mind, although in this case we’d be talking about “cooling the globe”. I think a more reasoned approach would be to look at matching roof albedo with the prevailing temps for an area. Areas that where buildings have a majority heat load, go for black roofs… areas with mostly cooling loads go with white roofs… areas in between go with “green” roofs (thermal mass) and you might see some significant changes in power consumption for building HVAC loads. No sense putting highly reflective roofs where it’s always cold outside and you’re running the heat all the time. Actions taken to increase energy efficiency are all around win-wins as long as they’re economically viable (or at least reasonable). GDP vs. Power Consumption is highly variable per capita between countries. Ref – so level of GDP as a direct relation to UHI might not be very useful… but I think what you guys are getting at is the change, or perhaps rate of change in GDP for specific areas could be a good variable to use. Very interesting! Dr. Spencer, do you think you could do a quick ‘how we derive temperature’ from the satellite radiometers? I can’t for the life of me work out how you can convert the ‘IR heat’ signal into temperature. I think there could be significant variables in play region to region, country to country, over time, etc. I spent probably too much time pontificating on power usage trends on Dr. Spencer’s previous posts, but there are probably hundreds of potential variables in play (avg. size of house, avg. pop per house, # cars on the road, per capita energy consumption rates, surface area trends of roads and road surface types, land use patterns, etc). Lots to think about. IN the US most suburban development starts with tree less land, that was farm ground, then as people move in they landscape and add auto watered lawns, ornamental trees, perennial flower beds, privacy fences, and major shade trees, line the new roadside. The settling of the entire mid west started out treeless in the 1800’s, now the trees make most of the houses in suburbs of small towns hard to distinguish from the air. It is a lot different than cutting prime old forests and bringing in herds of goats, sheep, lama, camels, yaks, water buffalo, etc. in third world countries, that denude the local forage until they have to move. Much can be said for factory farming and super markets with trucking system distribution in between. Dr. Spencer and I are looking at different things, so there is really no inconsistency per se. Dr. Spencer is looking at the difference in absolute temps between stations of differing pop density. I looked at trends in anomalies for stations with under 1 pop density, under 2 pop density, under 10 pop density, over 100 pop density, over 500 pop density, and over 1000 pop density. Hm!!! did that post before i meant it? Must know over what area is the pop density measured? I’ll see if I can find a plot. If you plot the data with a linear x-axis, how flat are the lines from 10/km^2 to 800/km^2? It looks like the there is a steep rise below this range and a steep rise above this range. Do you have any idea of what is happening? e.g. an area gets an airport above 800/km^2. Don’t know if it matters but all of the plots have a similar shape and it would be interesting to know what causes that. I’d be interested in what you find, but be aware, Dr. Spencer only did the time sequence for recent years and the UHI effect may and (probably) have a different outcome. You’d have to use the same time sequence to have a proper comparison. Tom G, as I understand UHI, it is not only direct surface changes that cause it. The construction of walls and other things reduce the cooling winds and breezes. The UHI effect on daily average temperatures mostly derives from the elevation of minimum temperatures at night. Going from 10 to 100 is ~0.2C for most years. Some years it’s 0.6-0.4=0.2 and other years it’s 1.1-0.9=0.2C. You need to subtract the span to get the temperature influence, not the direct number. Well, everyone else is commenting on the US difference, so I’ll toss in some thoughts. Urbanization in the US includes sub-urbanization. Given that farmers regard trees as weeds that shade valuable crops, as farmland gets suburbanized, tree population increases. US population spread is just that, spread. Subdivisions pop up in farmland, often miles from city limits and not close to other subdivisions. The gaps fill in over time, but the the density increase is gradual and happens over the range of densities. In Europe or Asia, additional population gets shoe-horned in next to existing dense housing. You have a fairly sharp divide in density. The urban density stays the same, just covers more area, and the rural part just retreats. Dr Spencer has some interesting data — But isn’t the UHI going to vary from place to place based on the geography, how the city is built, and what major industry the ‘area’ may be involved in. I suspect it would vary greatly, city to city and would not be very easy to quantify. Wouldn’t the only real way to know for each ‘city’ to run an experiment like the famous Watts driving tour? Well not exactly logarithmic at the US low end Dr Roy; but certainly a much more infrormative format for you to use for this data. Now I’d be whooping it up in the aisles, if I could just see a mean global surface temperature via logarithmic CO2 abundance over the last 600 million years curve that was even a faint shadow of yours. I’m not at all embarrassed to call your curves Logarithmic; or close enough so. Consider that population density is a proxy for heat production/absorbtion, which is highly dependent on what type of buildings you use and whether you have adequate heating or air conditioning. U.S. cities are in decline; the mayor of Detroit is proposing to bulldoze 1/4 of the city. Many have questioned stopping there (joke), but, the point is that the red-brick buildings of older hollowed-out cities will be mismatched to the population. Detroit should have a bigger heat-island effect per population density than Beijing. Northern american cities & European cities love red brick and tinted glass as well as asphalt & pavers for sidewalks; perfect for absorbing heat. Other cultures might like more reflective materials. You might want to do a spider web plot, where you draw a line between all stations on your map & color code by anomaly (based on your UHI warming vs. Pop Density plot). Anamalous cities should color differently when paired with their surroundings. You may discover something about these cities that way. The slight negative effect at low densities in the US could be what you might call a `golf course’ effect. In arid parts of the US lightly populated urban areas can be greener than rural because people plant gardens, lawns, trees, and water them. Soooo. . . as I recall, there are some portions of the globe that appear to be heating faster than others in traditional analysis. Siberia, I think, is one? Do we know how those sites have been doing re population density per km, since this shows relatively small increases in PD give rather large UHI increase results? “I have hundreds” of threatening emails, Stephen Schneider, a climatologist at Stanford University in California, told Tierramerica. He believes scientists will be killed over this. “I’m not going to let it worry me… but you know it’s going to happen,” said Schneider, one of the most respected climate scientists in the world. “They shoot abortion doctors here.”..
*This story was originally published by Latin American newspapers that are part of the Tierramerica network. Tierramerica is a specialised news service produced by IPS with the backing of the United Nations Development Programme, United Nations Environment Programme and the World Bank. An independent environmental journalist for 15 years my writing has been published in dozens of publications around the world including New Scientist, The London Sunday Times, Maclean’s Magazine, Earth Island Journal, The Toronto Star, Wired News, Audubon, BBC Wildlife, and Canadian Geographic. I am the international science and environment correspondent for the Rome-headquartered Inter Press Service News Agency (IPS), the world’s 6th largest global news agency. My IPS articles are published in over 500 newspapers and magazines all over the world reaching an estimated 200 million readers in up to 20 languages. IPS news is also broadcast by over 1000 radio stations, potentially targeting over 150 million listeners. I also write for IPS affiliate, Tierramerica, located in Mexico City and IPS bureaus in Johannesburg and New Delhi. Until you can convince me that the stations themselves are not corrupt for micro-climate influences, your entire approach is as suspect as Jim Hansen’s luminosity approach. I simply don’t see the physics of a massive jump in UHI for population densities below 100 persons per sq. km. Unless you address how much energy has to be generated by the 100 persons to generate a heat capacity that releases in a manner that raises the mean temperature, you are just playing with the numbers. That, itself, is not a bad thing, I suppose. But you need to get confidence in station placement and construction and do the math on the physics before you have even the begining of a credible new UHI analytical approach. Many commenters here are confusing UHI with GW. UHI is thermometer error that produces false warming estimates for the entire region around an urban centre / thermometer location. GW is an estimate of the drift in average temperature* globally over time. Urban areas make up a very, very small proportion of the entire globe. The objective is not to cool cities but to get good T data for the larger study. * “Global temperature” is, of course, a non-sensical notion because of the chaotic, transient, thermally partitioned nature of global heat. There simply is no place to stick a huge thermometer and get a true planetary reading. Al Gore hasn’t returned my phone calls. Almost everything in the climate exhibits a logarithmic nature. Temperature itself is logarithmic with respect to the energy which drives it so we should expect to see it here as well. The change to Log-Linear plot helps alot. Suggest exploring Non-OECD vs OECD to see if high vs low economic growth is significant. eg especially China, vs Russia, France or Germany. (Note the comments of Chinese stations being moved out with urban population growth). Looking at UHI vs time may show other interesting relationships. Could the 2x variation around 100 to 200 show some variation with el Nino or solar cycles? Could the “negative” UHI in the US at low population densities be related to shifting stations to airports? – e.g. where there is low population density but higher UHI for “rural” stations. I guess that buys you guys a temprary reprieve. The difference between US and non-US result is striking, typically on the order of +1 deg C for non-US regions above 100/km2. Since ‘non-US’ covers a great deal of territory, it might be useful to add one other parameter to this analysis that differentiates based on: latitude. Re-analyzing your data taking this one variable into account might explain the significant different between US and non-US results, and (if it proves to be statistically significant) would provide a more powerful argument to apply your UHI correction on a global basis. Latitude seems likely to correlate with UHI because, the warmer the “background” (i.e. the lower the latitude) the less relative change that human activity (population, buildings, electrical gear) would have on the local temperature. In contrast, in colder climes (i.e. higher latitudes), human activity would be likely to have a more pronounced effect on the local temperature. Simple example: If 1000 people (body temps 98 F) stand together as a tight crowd, the temperature above that crowd will be minimally different if the ambient temperature were 80 F (low latitude) compared to if the ambient temperature were 30 F (high latitude). Wow! It appears that “Energy Star” appliances and weatherization are having no effect in terms of decreasing the slope of the most recent curves. UHI effect can’t be all due to concrete and asphalt. “Real Climate” claims that the urban temperature monitoring stations are biased “too cool”, since the urban temperatures are adjusted to account for UHI. Does anyone here besides me have difficulty with that claim? So what? All approaches are suspect, aren’t they? Roy, I’d take that comment with a bag of salt. I don’t think anybody’s in a position to vet all the umpteen thousand stations as Dr. Schnare suggests. Your approach is almost certainly no worse than Dr. Hansen’s, and a perfectionist strategy at this point would just be silly. By all means, pursue your statistical investigation along the various paths. I’m particularly intrigued by the large annual variation in the global curves. Why should that be so? And why should the US differ so markedly from the rest of the world? As mentioned by others, splitting the study into four time-of-observation groups should be done. A look at the effect of latitude might be productive, too. The apparent dip in the US data may be related to standard error. I think you’re digging in the right place. So Armargh still shows a warming of about 1 deg C allowing for UHI. It is intersting to think that rural depopulation could explain the higher temperatures in the early 20th Cent. Perhaps AGW is worse than we think! That seems a little odd; evidently climate and Physics behave somewhat differently. My Physics Handbook gives the Total Kinetic Energy for an (ideal) gas as being (3/2)N.k.T where N is the number of particles, or the mean Kinetic energy per particle as (3/2)kT, which would then seem to apply also to a non-ideal gas since it is a per particle (molecule) energy. k is of course Boltzmann’s constant. So that must not be the energy that drives the Temperature, since it is quite linear with Temperature, rather than logarithmic. I guess I need some Climate text books, to see how it is different. Could get at land use effects by comparing rural temperatures in Dominican Republic vs Haiti. The differences in land use are striking, unrealted to climate. Dr Spencer – fantastic, creative work. Agree – needs to be published as a paper, but I would give it as a talk at any local meteorologic or geologic society to ensure retention of IP. My guess is – Mr Watts would concur given the rough treatment HE received. You should be proud. Awesome breakthrough. You can extent this chart out (ending at 456 W/m2) to 63,250,000 W/m2 for the surface of the Sun and the temperature derivation of 5,779K will be correct. 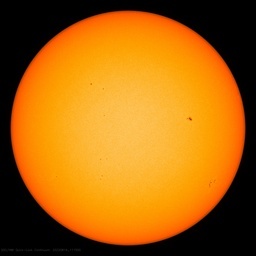 The Sun needs to add 43,800 W/m2 to increase its surface temperature by 1.0C while the Earth only needs to add 5.5 W/m2 to increase its surface temperature by 1.0C. If you want to estimate anthropogenic joule heating of the globe, you need to take the ratio of total anthropogenic joules to incoming sun joules (insolation) for the same time period. First subtract all anthropogenic joules generated from renewable energy sources (wind, solar, hydro) since those are just the sun’s energy redirected. This is a very rough estimate. This is a 0.0000254% (254 ppb) increase in heat due to humans. Dr Spencer, why did you decide to use GMT times globally rather than local sidereal time? I bet Joe the plumber, (Joe six packs brother) could tell you the average time it takes to freeze plumbing in an empty house when the power goes out, Just from looking back at his emergency work call logs. I would bet it runs less than 72 hours with highs @ 40 F and lows @-10F. >Temperature itself is logarithmic with respect to the energy which drives it so we >should expect to see it here as well. Temperature is a measure of average kinetic energy of the modes of molecular motion. So, it’s a direct measure of molecular energy, so long as the modes of motion don’t decouple. An example of decoupling is the fact that electrons in a fluorescent lightbulb have a temperature of thousands of degrees F, while the heavy ions are basically at room temperature. This knowledge was a huge breakthrough in physics and, surprisingly, it isn’t really clearly stated at the undergrad level. Dr Spencer; After examining your graph I would offer this for U.S. land use. 1 to 5 per km2 is real farm and rural densities, open land, very few homes with little AC and some heating. 5 to 50 is funny farm to suburban, lots of trees and grass and a few high quality homes with HVAC. Over 50, high density, lots of roofs, pavements and building HVAC. The change in land use from real farm or rural to gentel farm and estates would cause quite a drop in local temperatures due to shading and ground covers. Dr. Spencer’s first refereed comment! Dr. Judy, are you out there? Like someone else mentioned, this needs to be repeated for each of the 4 temperature readings per day to see when the effect is greatest. Another thought would be to check this in different seasons, all I ever hear is winter is affected more than summer, but will it prove out that way? DeNihilist DePlumber finds that most frozen pipe calls, from occupied houses, occur when there is a strong wind and cold temps. Have gone through 3-4 weeks of calm cold (-3/-8C) with no calls. Yet in a week of 1/-4C with biting winds, the phone never stops! When Willis Eschenbach plotted Armagh back at this post, without such adjustments he got 0.57 deg C/century. During the late 60’s thru the 70’s, they cut down millions of Elm trees that once created a cathedral-like effect over most of the streets of my hometown 750,000 pop. It was quite cool at street level with the giant Elms in place, and became noticeably hotter when they were cut down. The spread of the disease is well documented, and should have some effect on the local temperature in the cities effected. The Maples, Ash, and other trees that replaced the Elms are now covering the roads for the most part once again. Also, in the same area, starting downtown where yards are postage stamp sized, the yards grow in size with every ring of suburbs. Many newer subdivisions have 5 acre minimum lot sizes specifically to discourage urban sprawl and long commutes. Suburbs built in the 70’s on farm land now look like forests with houses scattered amongst the trees. It would be very interesting to know what the temperatures looked like before, during, and after this huge deforestation that exposed all that man-made stuff beneath. At the time, everyone was aware that it got hotter, and they knew why. I doubt the heat has been “generated” by the people. As toyotawhizguy (18:50:14) shows, our efforts to heat pale into insignificance compared to the sun’s effects. UHI is a largely matter of how much we trap the sun’s heat and then release it slowly overnight. Wait for a warm, sunny day with clear night. Then compare the temperature in a field with the temperature in a asphalt parking lot (away from artificially generated heat). That’s UHI. Not a joule “generated” by anyone. Take a snowy grass field and asphalt area. Clear an equal small area of snow from both. Come back two clear days later, and see what has happened. Lots of snow will have melted on the asphalt, and barely any on the grass, yet not a joule generated by a human to be measured. The “energy” does not need to be generated by the 100 persons, it just has to be stored in the nice new concrete and tarmac and re-released during the hours of darkness. Although this also has to be quantified. I should apologise for the flippant post that I made when you first reveiled that you were trying to quantify the UHI effect. I suggested that such an enterprise was futile in view of the complexity of the task. However, having taken the trouble to look at what you have done on the subject, I would like to say that I am very impressed by the power of your approach and I believe it could well develop into the definitive work. I expect that as Dr Spencer continues his research, his findings will become clearer. At the moment it is not clear to me what he is attempting, but maybe I just don’t understand what he is trying to say. Just looking at the first chart, which plots the urban heat island warming in degrees celsius against population density, it appears that he is saying that even areas that are by no means urban nevertheless demonstrate an urban heat island warming, which is quite substantial. Even those places that have a very low population density (3 people per sq km) have a measurable UHI warming of between 0.17C and 0.3C, according to the chart. Or maybe I have misunderstood the labels on the axis. Three people per sq km is each person on average occupying the equivalent of about 330 quarter-acre house blocks, if my calculations are correct, which is not normally considered urban. Places with only ten people per sq km have a UHI warming of between 0.37C and 0.78C. This population density is the equivalent of each person on average occupying the equivalent of almost 100 quarter acre blocks. This doesn’t seem to be urban either. I hope someone will be able to clarify this. We call cities, towns and hamlets “Heat Islands”, from your perspective at UAH aren’t they more like factories with smokestacks, of various sizes of course? If so, aren’t these various sized smokestacks pumping heat into the atmosphere in a way similiar to all smokestacks? Doesn’t the “smoke/heat” move vertically and then, at a certain level in the atmosphere, start to move in a horizontal direction? Isn’t this average level near the same level your spacebased readings for monthly global temp anomolies are measured? To get a picture of actual surface temperatures, might not space readings at a lower level -closer to the surface- be equally significant; and for day-to-day ‘people environment temps’ perhaps more significant? I’ve just posted a comment on the discussion of the original UHI paper of Dr Spencer’s, wattsupwiththat 03/03/2010, explaining how I think that Dr Spencer’s method can only result in an overestimate of the UHI. I outlined a test to confirm this there. There are clearly other problems too. All the graphs presented here seem to rely on differences at population densities less 20 persons per square km. These are then integrated up. Once past 20 persons per square km all graphs seem about parallel. I suspect that the differences seen between years and areas are largely down to errors in the analysis or underlying assumptions at these low population densities. Perhaps this could be checked by dropping random stations from the analysis? Randomly ditch half the low population stations and see what happens. Or ignore all stations in a particular population bin – say bin no. 2 – and rely on comparisons spanning across that bin (bin no. 1 to bin no. 3). If the analysis is robust these sort of tests should not effect the outcome significantly. The fact that the results can be changed significantly by the addition of interstation comparisons within the lowest bin suggests it is not robust. I think that this could form a useful basis for estimating the UHI but at the moment the problems and unknown errors in the methods render it all largely meaningless. So I guess the next question is this: can you, from such data, make a ‘reasonable’ adjustment to temperature records of urban stations to determine what residual warming signal remains after UHI effects are eliminated?? The other question I pose is this one: what percentage of the earth is ‘unpopulated’? And hence what is the ‘true’ ‘global temperature change’ if you factor in the small % of the earth which has a UHI signal???? It’s always amazed me that some people actually think that things such as asphalt, airplanes, cars, and air conditioners among other things can’t contribute to a bias in temperatures. Some have even gone so far as to say that the bias in temperature is insignificant. My back of the envelope calculations on electrical consumption gave an average “urban” forcing of ~2.7 W/m2 (did not account for any other type of fuel consumption like natural gas, heating oil, or those heat engines we climb into every day to go to work). Averaged out for the earth’s surface, our ~18 TW of electrical consumption is just noise, but when you consider that at least 50% of said consumption is concentrated on just ~1.5% of the earth’s land surface (not to mention the heat island effects around power plants probably in the neighborhood of 36 TW’s worth of forcing) then I think it’s safe to say that power consumption could constitute a significant local effect. That said, I do agree that this is a relatively minor variable in comparison to the effects of albedo and thermal mass due to land use changes. That is a very interesting point, on non-windy days heat island signatures should be able to be seen in the satellite records due to convection. Of course, there is the question of resolution for the satellite records (which I don’t know the answer to, I’d think it could do 1 km2 maybe) and what you’d be looking for would be real temps I bet… or maybe I’m the only one who thinks the whole anomaly analysis just confuses/obfuscates. I’ve identified a new phenomenon which I am dubbing the CRU Heat Averaging Effect. The statistical trend line for northern hemispheric temperatures peaks in 2003. The statistical trend line for southern hemispheric temperatures peaks in 2004. The statistical trend line for global temperatures peaks in 2005. OK. Looked at the “raw” numbers and that’s what comes out of the five year trend line. Hey, taking your comments upside-down is great way to prove CO2 has no local heat effects at all. Thanks for the reverse tip! I learned that it was (1/2)*k*T for each degree of freedom. For a monatomic gas, (3/2)*k*T is correct. For a diatomic gas, it becomes more complicated. I’ve seen (3/2)*k*T, (5/2)*k*T, and (7/2)*k*T depending on the temperature. At room temperature, then (5/2)*k*T works for a diatomic gas. You’ll notice that most of the atmosphere is composed of oxygen and nitrogen and those gases are usually diatomic. When you add in carbon dioxide, methane, water vapor, ozone, various noble gases, and other trace molecular gases, then the actual formula is not that simple. Whatever happened to the warm period in the 1930s, it isn’t in either the NH or SH? Phil and I have had this discussion before. Of Course, the concept of an ideal gas, containing N point like particles, can only have the three translational degrees of freedom, and its rotational energy would have to be zero since such particles would have no moment of inertia. The (5/2).kT for a diatomic gas assumes a dumbell molecule, which would add two rotational degrees of freedoma perpendicular to the axis of the molecule. The moment of inertia for rotation about the molecule axis is assumed zero, but I suppose in reality it isn’t quite zero. The nuclear component must be PDsmall, but the electron clouds probably have some moment of inertia more than zero. But for any gas (atmospheric) mixture each component still has a total energy that is linear with T, so the mixture would also seem to be linear with T.
My Quantum mechanics is only of restricted extent, so I’m not up on the possible couplings between various modes in a polyatomic molecule; I’m guessing that Phil knows all of that stuff. In any case, I believe that the thermodynamic Temperature scale is only defined in terms of an ideal gas, so the scale itself is quite linear. The question becomes one of how linear with the real thermodynamic Temperature scale, is the atmosphere’s total energy. Maybe ? Is there no sattelite that has some version of a FLIR camera that can just look down at cities and measure the UHI directly? Seems like something that could be done relatively cheaply with weather balloon and a camera and an enterprising grad student. Back to the central subject of this thread, which is this interesting evidence that Dr Spencer and Prof Christy are working on showing an effect of “civilization” on local heating, or UHIs if you will. It seems irrefutable that any changes in the natural planet as Gaia made it, would change the thermal processes. Hey wait till you see what going solar is going to do to the thermal processes (in theory). I see the problem, not as a problem that human contraptions get hotter than Gaia’s contraptions; but when it comes to counting up those effects, we aren’t doing that properly. The elevated temperature of a UHI is not of itself a problem. The problem arises, when we take the temperature on the runway at San Jose (International) airport, and try to claim that that is what I must be enjoying, when I am out fishing in the middle of the sea of Cortez 1200 km away. We have to stop extending the influence of UHIs beyond where Gaia says they are getting in her hair. If you want to estimate anthropogenic joule heating of the globe, you need to take the ratio of total anthropogenic joules to incoming sun joules (insolation) for the same time period. Except you leave out latent Geologic heat from Earth’s core, and it surface radiation via volcanic activity. The correct approach would be to add Gj to insolation Ij. The smaller US UHI-related warming agrees with McKitrick and Michaels finding of generally smaller warming bias in the US vs the rest-of-world. Then when one considers all of the US measurement station problems unearthed by Anthony’s army of volunteers, one realizes how shoddy the data from the rest-of-world actually is. I’ve had the same thought. I also had the silly thought of using near surface (but sub surface) temperature readings as a natural way of averaging out surface temps. I read somewhere that, I think, 6ft below the ground (at least in zones that are not geotherm active) the temperature will be the average of the surface temp. Another approach, which might be more effective for researching the UHI effect on surface temperature records, would be to surround a structure (maybe an asphalt parking lot, power sub-station, house, etc) with an array of thermometers 2m off the ground (i.e. replicating a the temperature stations) so the effect can be demonstrated spatially. A similar exercise could be performed around a city. Actually, the rotational moments of inertia for atomic species and about the axis of linear molecules is VERY large, as opposed to either zero or very small (it’s a lever-arm argument and the lever arm is essentially zero). The kinetic energy of a “thermalized” molecule is the sum of 1/2 k T for each accessible degree of freedom at temperature T. The translational degrees of freedom have, as far as we can tell, continuously graded energy levels (i.e., they are classical degrees of freedom and not quantized). For non-atomic species the rotations are quantized, but for many or most species the energy spacing is very low. Because of this many rotational states (l=0,1,2,…) are at or below the available free energy (k T) so that the rotational state populations are typically populated in a pseudo-classical (the state populations are Gaussian-like) manner. For each quadratic mode of a species that can be said to populated in this classical manner there is a contribution to the overall kinetic energy of 1/2 k T, as stated before. For monoatomic gases, therefore, the kinetic energy is 3/2 k T since there are only 3 translational degrees of freedom and no *accessible* rotational degrees of freedom (all species are in the ground rotational state – the first excited rotational state of atomic species is typically an x-ray or gamma-ray transition and is in fact an energy transition of the nucleus – and therefore not accessible *thermally* at atmospheric temperatures). For diatomic gases there are two typically accessible rotational degrees of freedom (the axial rotation is again an x-ray transition) and can contribute therefore as much as 2 * 1/2 k T to the kinetic energy, or 5/2 k T. Here come the next two big caveats. One – those accessible degrees of freedom, as mentioned before, have to have inter-state energy spacings much smaller than the thermal energy or they will NOT be populated in a near-classical (Gaussian-like) way. Like the high-energy axial-rotation case they will have all or almost all of their state population in the ground state or the ground state and the first excited state. It depends on the moment of intertia. Diatomic molecules with very *high* moments of intertia (like iodine or bromine) have very *small* energy spacings bettween rotational states. They are, therefore, usually considered “classical” rotors ate low temperatures and have very classical-like state populations and threfore also have total kinetic energies very close to 5/2 k T (wait, there’s another consideration). Light molecules, like H2, have very LARGE energetic spacings between rotational states (on the order of 0.1 eV, and kT at room temperature is about 0.025 eV) so that almost all of the rotational state density of H2 is in the ground rotational state for H2 at room temperature. So the total kinetic energy of H2 is pretty close to 3/2 kT (at room temperature) even thought it’s a diatomic molecule. So, obviously, at high temperatures all diatomic molecules can have a kinetic energy near 5/2 k T and at low temperatures nearly all diatomic molecules can have a kinetic energy near 3/2 k T. One often speaks of the “characteristic rotational temperature” of a molecule. This temperature is the temperature at which k T is approximately equal to the rotational state spacing of the molecule and therefore the temperature at which rotational degrees of freedom start to affect the total kinetic energy. The next major caveat is vibrations. All of the same arguments apply and there is also a “characteristic vibrational temperature” that works exactly the same way it did for rotations. A molecule like H2 has a very high characteristic vibrational temperature so its vibrational degree of freedom at room temperature is dominated by the ground state and it makes virtually no contribution to the total kinetic energy. The same can be said for most atmospheric constituents. A diatomic molecule like iodine or bromine would, however, have a significant contribution from the vibrational degree of freedom at toom temperature and therefore have a total kinetic energy between 5/2 k T and 3 k T.
It get’s more complicated for polyatomic species. Too long, not gonna edit for content. Sorry for any typos, etc. Until you can convince me that the stations themselves are not corrupt for micro-climate influences, your entire approach is as suspect as Jim Hansen’s luminosity approach. I simply don’t see the physics of a massive jump in UHI for population densities below 100 persons per sq. km. Unless you address how much energy has to be generated by the 100 persons to generate a heat capacity that releases in a manner that raises the mean temperature, you are just playing with the numbers. If you look at the numbers that have appeared on this site before, you’ll know that as far as the UHI effect is concerned, energy usage is actually small compared landscape changes (perhaps Barrow, AK & other Arctic sites would be an exception). Brick walls, asphalt roads, clearing of vegetation all have much larger effects due to changes in solar absorption, heat-retention, water-evaporation or wind-blockage than energy-usage does. I feel sorry for Dr. Spencer as so many of the comments appear to be off base. Certainly it is interesting to study many different UHI impacts, like brick building vs. steel, airport changes, gdp, elevation, societal differences, windy vs. windless conditions, and so on, but none of it matters to Dr. Spencer’s analysis! Simply look at the population change around each location from the beginning of the record to the end and apply the appropriate corrections along the way, then add the corrected data to the file that goes into determining the global trend. That is what they have been doing all along to ‘correct’ for UHI, the only difference is that they used the Jones et el method from around 1990, that Jones now openly admits was wrong. (Many people knew this from the beginning, but couldn’t prove it because it was based largely on bad data from China that no one had the means to dispute.) Dr. Spencer’s method is much, much better, for it is based on all the available data, not just a few choice locations. Aside from the global temperature trend, there is really not much reason to be concerned with UHI at all, so determining the specific UHI for each location is a lot of work for little purpose, when the average UHI effect is all that is really needed to determine the average global temperature trend. Yikes !! I do love it when my “stick in the sand” scratchings, stimulate the noggins of others who know the real scoop. So thank you Merrick for your long post, typos and all, if any; it is safely stored now as a WORD file in my Climate folder. But now you need to explain some things which I seem to be stuck on; specifically that first sentence above. Thinking in terms of a stone age “planetary” model of an atom, I assumed that the nuclear mass was so tiny, radius wise, that its moment of inertia would be very small in the molecular scale of things, so the atom moment of inertia would be just due to the much lighter elctrons but now at some sizeable radius (so I AM puzzled when you say the lever arm is essentially zero). Now I can see, that even in such a bricks and mortar model, those things do have dimensions that aren’t zero, so the moments too wouldn’t be, and I guess if you spin fast enough you can get some real angular momentum going. But does say, an Argon atom have a moment of inertia anywhere comparable to say a CO2 rotating about the C; perpendicular to the molecule axis ? And then for the dumbell diatomics like O2 and N2, what is the rough relative sizes of the moments spinning on the molecule axis, versus perpendicular to that axis. The (5/2)kT form presumes that it is negligible in comparison. But then, I suppose, even given a small moment, one could still store energy; you just have to spin a damn side faster. Then I suppose there is the whole issue of just how do you couple energy into those modes. The “ideal” gas concept assumes point like particles so it essentially defines rotational moments as non existent; hence the (3/2)kT. But back to your dissertation above. Can you recommend any standard textbook that teaches that stuff at about that level. I think I can get my teeth around things at that level; with the right text book. I gave up on Reviews of Modern Physics years ago, when I found whole papers where I couldn’t even understand any word with more than four letters. For the last umpteen years, I have been buried in the Solid state Physics of semiconductors, to the point where I have forgotten most of what little I used to know about atomic/molecular spectra in gases. So if you know what the OED of atomic/molecular physics is at that level, It would be very nice to get. But I’m still puzzled by the notion that the moment is large because the lever arm is small, as you put it above ? A few, like beng, have addressed this comment very nicely. I will not be so nice. I am absolutely appalled that someone with a Phd, working for an environmental group for the purpose of influencing public policy, would believe that UHI’s are the sole product of how much heat people release into the atmosphere! Maybe he has a Phd in social studies or economics or something, but it better not be in a physical science. If it is, than he must have purchased one from a university, because he certainly didn’t earn it. The fact is that you can have a UHI develop if there is only one person in that square kilometer for the entire length of the temperature record, never releasing any heat other than from his body. If that one person turns an open field into an expanded driveway, builds a tennis court and a large home (that he never heats internally, just for the sake of argument), near the observation site, there will be a significant UHI effect. Sure, if you are constantly pumping the exhaust from a heat source directly at your thermometer, than the heat generated by humans will make a difference at that particular site, but the vast majority of sites do not have that, and the indirect heat humans produce, bleeding into the atmosphere from homes, buildings, cars and so on, is usually negligible compared to the impacts of solar energy on varying surfaces. If Dr. Schnare is an example of the level of ignorance that goes into the generation of public policy, then we need not fear global warming or nuclear war. We will all be dead of stupidity before anything else! Sorry, mistyped and didn’t edit! It’s a question of energy, not momentum, per se, and their relationship. If, as in the case of axial rotation of a diatomic molecule (or rotation in any axis for an atom) the lever arm length, R, is nearly zero (momentum is very small), you can see that to transition from the ground rotational state (L = 0; E = 0) to the first excited state (L =1) or higher will take a LOT of energy. The internuclear distance for ground state H2 is about 740 pm and the diameter of the hydrogen nucleus is on the order of about a femtometer. So the transition 1 <- 0 for the axial rotation is about (740/0.1)^2 times as energetic as the 1 <- 0 transition for one of the two perpendicular rotations. That's a hard gamma ray. That's the extreme example. In most cases the nuclear diameter is about an order of magnitude larger than that, so that the transition ratio is about 100 times less. So, as you say, the moments are very small along the internuclear axis – this means the transition energies are very large. As you say, the contributions of the axial rotational degree of freedom for diatoms is VERY small. These perpedicular for "heavy" molecules like O2 and N2 make those rotations very "classical" at room temperatures. So 5/2 k T is expected for them. Very light diatoms like H2 have kinetic energies at room temperature much less than 5/2 k T. And again for the same reason. For the very light molecules even the moments perpendicular to the internuclear axis are relatively small (compared to k T) so that even those degrees of freedom end up contributing much less than 1/2 k T each to the total kinetic energy. Sorry for the confusion on my mistatement regarding momentum. Make that (740/0.001)^2 – I hate re-reading what I type! All attempts to systematically quantify UHI effects either individually or in some aggregate average sense should be welcomed. With almost all long-term temperature records coming from population centers, rather than from pristine green fields, intensification of urban heating by a variety of factors is what introduces positively trending bias in most records. Yet, the wide range of results shown for different years here suggests that that something besides the population density per se affects the temperature elevation in population centers. Much as I would welcome a reliable UHI “correction” for the bias in the aggregate “global” record, we’re still far from a solid basis for making such corrections. Perhaps the best that can be done is to exclude the patently corrupted records and compile estimates from from far fewer, less-biased records. Well my mind was sort of fixated on Infra-Red molecular situations. Funny thing is at one time or another I have worked in some way, all the way from down to (but not including ) DC out to Cosmetic Rays; perhaps with the exception of X-rays, although I did once work on an exploding wire contraption up in McMinville Oregon once; which made hard X-rays for x-raying steel or cast iron to look for flaws; but I only worked on the fast pulse generation that was going to blow the tungsten wire to smithereens. But you’re talking to a chump who lost all his High School, and University text books; actually about 49 years ago tomorrow, as it turns out; so the noggin is slowly losing what was once in there. So if you can refer me to a modern college text, at Masters/PhD level, it would certainly help stem the outflow. And yes you pegged the OED part. There was a time, when I thought that spectroscopy was just the neatest thing since sliced bread. In my Freshman Physics year, we had to do a two day lab using a 1 cm Fabry Perot Etalon, along with a dispersing prism, to measure the wavelength of some red line, in the spectrum of Neon; they claimed you could measure a couple of lines to better than 0.01%. I started digging into the theory of the Fabry Perot Interferometer, and about a month later, I presented the Prof with a list of about 22 red (mostly) Neon lines each, called out to 8 significant figures. It seems that somewhere in there I had to use a Mercury 198 source lamp as my primary reference. You probably won’t believe this but I actually use the wavelength of a spectrum line, along with some other descriptors to come up with a 12 character password, that somehow I have remembered for about 50 years; but it isn’t one of those Neon lines. And I can use the same password with some character transpositions for my ATM PIN number, now that my bank can take from 4 to 12 digits. There is a big difference between doesn’t matter and doesn’t matter to Dr. Spencer’s analysis. I agree, and have even said as much in my posts, that microclimate analyses are OT for his work, but at the same time it is an area that has not been adequately studied – especially as it pertains to potential skewing of temperature records. What happens when an asphalt road is laid 10ft away from a station, 100 ft, etc – nobody knows. Many (most?) here suspect upward bias in general, many suspect bias effect in particular on Tmin, and consensus theory claims anywhere from no effect to they’ve already corrected for it. I look at it this way, Dr. Spencer is coming at it from a macro perspective – it’s great work and needs to be done. Some here, like me, are more interested in looking at it from the micro perspective. That’s not to say Dr. Spencer is wrong – far from it – we’re just looking at it from the other direction. That said, he’s already identified at least one significant difference between the US and the rest of the world, and on his first post many posited that these trends would vary on a country and/or latitude basis. There were also questions – on his second post I believe, the snapshot of 2000 – about how consistent the relationship would be year over year, which this analysis seems to show unexplained variation – which could just be noise, or could be a sign of something else all together. I’d tend to say the one thing left (assuming US vs. rest of the world is the only significant variation in the shape of the relationship and not latitude or other country/regional differences) would be to run the analysis here for the full range (1990-current) to see if the variation is relatively constant or varies over time. It probably wouldn’t fit, but I would also be very curious about seasonal impact/differences from UHI as well. I am sorry if I misunderstood the discussion of microclimates. I was taking those comments in this thread as ‘shortcomings’ of Dr. Spencer’s argument, as if he needed to consider these things for his method. I think we really agree on everything. I didn’t mean that the study of microclimates is irrelevant, only that it is not necessary to consider the microclimates to develop a workable UHI correction for the global temperature trend. Kudos to Dr. Spencer for his investigations into the UHI topic. Although his initial interest may have been limited and observational, it (obviously from the comments) unearths a bevy of questions about causation. He may have hit the jackpot on unanswered questions. If you model the power dissipation of a human, and the power he uses, you will see that by the time he reaches the population density of Manhattan, man is (in the aggregate) swamping insolation even during the day. Smaller cities get there at night, affirming the many comments that the UHI effect is strongest then. Lower concentrations yet cannot be so directly driven, but depend on land use changes. The stunning difference between the consequences of those changes in the US and non-US seems likely to result from their different tactics. I hope that we will see this area studied in detail in the coming years. If there is/was any indication here that because Dr. Spencer was not approaching this from a micro standpoint his work is somehow invalid, then I take no exception to your comments whatsoever. I hope I never gave that impression with what I wrote, and if I did (or anyone else did) a correction was most definitely in order. At some point (I think regional and latitude analyses), pushing his approach too far down to the micro scale would result in an attempt of “boiling the ocean”… so you have to draw the line somewhere. Now at the risk of going OT again, I do think there is a (possibly rhetorical) question of paradigm that is worthy of discussion at some point, and that is… should we really be correcting UHI out of the temperature records or should we be measuring it? I think this goes hand in hand with the more pressing question of what is an appropriate minimum resolution for the surface temperature record (ex: I believe GISS extrapolates up to 1200km in the Arctic)? Today, GISS claims UHI is possibly overcorrected out of their reconstruction (although at the same time they have the hottest map around). I believe CRU does little to no correction, and I’m not quite sure what the two other surface sets do. More than likely, IMO, this results in what sould be small(ish) red dots of UHI instead being big(ger) orange blobs of “climate change” in the surface records. From a lower troposphere (sat record) viewpoint, because of convection and wind… I’d posit that UHI would also show up as blobs there. What this means is that any error in UHI correction, in either direction, would result in a diffused effect in the grid (if not surrounding grids) just the same way that UHI affects it. For now, with the information available, I’m not sure if there is any better approach one could take than Dr. Spencer’s work here. I know how to compute the average of a continuous function; assuming just one independent variable and a single variable dependent on that, you clopuld plot a simple y = f(x) graph, over the operational range of x and y. Then you simply integrate the area under the graph, and divde the total area by the total range of x, to get the average value of y. So simple. If of course, you only have data for discrete values of x, then you would multiply each appropriate y value, by the total extent of x that gives the same value for y. For example, x could be an element of area ; say on the surface of the earth, and y could be the Temperature for that element of are (maybe a daily average value). So you simply multiply each element of area, by the appropriate average daily temperature for that element, and then sum all those products. The sum of all the elemental areas, is simply the surface area of the earth; so you divide the grand total by the total surface area of the earth, and ; voilla ! the answer is the true average surface temperature of the entire earth; well it is true for whatever time element over which you measured the average of the Temperature for any area element. Of course you have to make all the area sample measurements at the same time epoch or else it isn’t valid, so you have to measure them all at the same time. Well that is so easy, even an 8th grade or maybe a 4H student could do that; well if they have the data of course. So presumably ;and you know the hazards of that; GISS or HADCrud etc have all those Temperature numbers form each of their global owl boxes; ans also presumably, logged in along with the GPS co-ordinates of that thermometer, is the value of the element of earth surface area for which that Temperature reading is valid, may 10 squ km or somesuch number; maybe it could be as high as 100 squ km. I presume that for UHIs, the area is much smaller, say five times the area of the total UHI concrete area, or some similar extrapolation. So just why is it that these agencies are having so much difficulty doing what a 4-H club member could do, if they had the data ? High speed solar wavelengths are causing the the building materials to polarize at high speeds and generate heat the building isn’t designed or insulated for.